Russia Web DC is our own datacenter in Moscow, Russia. Choose one of the pre-built bare-metal setups below or assemble your own. Germany Hetzner datacenter in Nuremberg. Only pre-built bare-metal configurations are available. Platform restricts discs technology for a server lifetime. Our service comes with the cutting edge server equipment. Top of the line CPU, RAM and storage. Optional DDoS protection available. We offer 95% guarantee against network-level DDoS attacks. Technical support team is available 24/7, free of charge. We offer fully managed bare-metal dedicated servers. 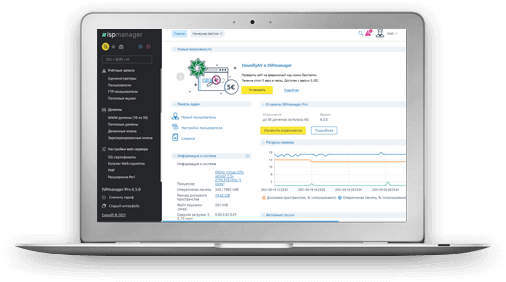 Enjoy your dedicated server experience with the free ISPmanager control panel, even if you’re a beginner. Website antiviruses ImunifyAV (ex. Revisium, enabled in ISPmanager by default) and Virusdie finds and cleans malicious code automatically, with no impact on server's efficiency. Easy to activate and set up in the ISPmanager control panel. Moduls do not restrict the amount of checked websites. How to activate and use the antivirus? We’ll transfer your data from another hosting provider and deploy the backups if necessary. How to Choose a Bare-Metal Server Based on a Processor? The choice of a processor is one of the most important and paramount issues to the future performance of your bare-metal setup. We use Intel processors in all our dedicated servers as they provide performance at the most reasonable costs. Their architecture and technologies are constantly improved, and the wide range of the processor models meets the requirements for the greatest variety of business purposes. Intel Core I7 is the best option for a dedicated server among advanced mid-segment models. They have 4–8 cores, up to 20 Mb third generation cache, up to 3.5 GHz frequency and 14nm process. Supported hyper-threading technology allows for up to 12 (depending on the CPU model) virtual cores. The processor supports Turbo Boost which automatically increases the processor’s performance when required. The improved architecture of Intel Core I7 and support of all new virtualization technologies makes this processor line-up suitable for almost all server tasks for small enterprises. An Intel Core I7 based server can be used as a loaded application server, for setting up a large-scale portal and broadcasting projects which need high processor’s performance but do not have any strict requirements for the memory and speed of the drive subsystem. A Core I7 based server is the best solution if the server application requires the highest processor speed in single threading. With this processor, a server can withstand a load of approximately 1 million simultaneous HTTP connections, 50,000 PHP connections and operation of modern network video games. Intel Xeon E3 is one of the highest performing high-end processors. It is a server processor which is adapted for operating in multiprocessor systems, has third level cache memory up to 8Mb and 2 – 4 cores. Xeon E3 operates with up to 32 Gb RAM and is fitted with Intel HD Graphics 3000. This processor has a memory controller supporting error-correcting memory modules which is very important for servers used to accomplish business tasks. FlexMigration technology eliminates the possibility of failures in operation of virtual machines with the server. Intel Xeon E3 also supports hyper-threading and Turbo Boost technologies described above. Thus, an Intel Xeon E3 based single-processor server suits perfectly for dealing with most tasks of small and medium enterprises; it can be used successfully to accomplish particular tasks of departments in large companies and is able to operate with graphical applications in large data processing centers. Moreover, if cloud-based applications need to operate with the lowest possible energy consumption, constant traffic transmission and other conventional capabilities, a server with Intel Xeon E3 processor will cope with these tasks perfectly. Intel Xeon E5 is also a high-end processor with 4–8 cores each of which operates at its own frequency, 8 Mb of third generation cache memory and supporting up to 144 Gb RAM. Intel Xeon E5 based servers provide improved data protection due to built-in hardware features supporting constant data encryption without compromising performance significantly. Intel Xeon E5 processors support Intel Integrated I/O technology which reduces delays in the network and data storage devices in virtual systems and supports PCI Express 3.0 specification for handling applications that require high throughput. Moreover, starting with this Intel processor model, it has become possible to use servers with dual- and more processor motherboards. Intel Xeon E5 is able to operate in dual-processor systems which increases the server performance considerably – by 80–90% of each processor’s performance. This server executes two streams of instructions at the same time while a single-processor server whose all resources are engaged in dealing with a single stream, queues the second one. Two Intel Xeon E5 processors provide the most evident increase in server performance when operating speed increases almost twofold. Programming environments and distributed data bases operate much faster as well. Intel Xeon E5 based servers are perfect for the load of any intensity including basic infrastructure, virtualization, industrial computations, clouds and big data. Xeon E5 meets all requirements for virtualization, operation of various mail servers and email transmission of any intensity, operation of powerful database servers, and resource-intensive applications including graphical ones. The server is suitable for medium-sized businesses, energy and financial companies, healthcare and scientific organizations. Or choose a ready server from the list above or configure your own. Click “Order” and go to the client area for registration and purchase. Once the service is paid for, access details will be emailed to you.